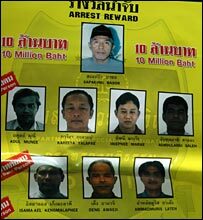 In the second of a series of articles about the continuing violence in southern Thailand, the BBC's Kate McGeown looks at who is behind the attacks. "I'm very sorry for the families affected but we can't avoid these things happening," said the polite, softly-spoken man. "If we keep quiet, the government won't take notice of what we want." The man I was talking to claimed to be a senior member of the Pattani United Liberation Organisation (Pulo), one of the main insurgent groups in southern Thailand. The incidents he was referring to are the almost daily bombings and shooting attacks targeting representatives of the Thai authorities - police, soldiers, officials and local informants. The ongoing violence, which has claimed the lives of 1,300 people since 2004, is thought to be the work of a shadowy network fighting for a separate Islamic state. But little is known about the different groups involved, or their exact motives. While the main grievance appears to be about land, the fact that the area is predominantly Muslim while the rest of Thailand is almost exclusively Buddhist undoubtedly fuels the insurgents' cause. Pulo was particularly active in the 1970s and 80s, but in recent years other organisations have been blamed for the majority of attacks. Groups such as BRN (the Barisan Revolusi Nasional), its offshoot RKK (Runda Kumpularm Kecil) and GMIP (Gerakan Mujahadeen Islam Pattani) are frequently mentioned by regional analysts. 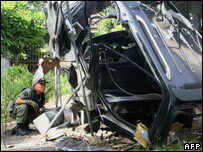 RKK is thought to have been particularly active in recent months, with the Thai media blaming it for more than 40 co-ordinated bombings across the southern provinces on just one day in June 2006. Lieutenant Narong Suankaew, an army commander based in Narathiwat province, has drawn up charts to study this mysterious new group. "The RKK is responsible for most of the violence now. The main task for me is to destroy this organisation," he said. The Pulo insurgent acknowledged that different groups existed, although he refused to name them. He said they had a common purpose - the creation of a separate state, harking back to the ancient Kingdom of Pattani, a semi-autonomous Malay region which was annexed by Thailand in the early 20th Century. "It's necessary to attack the authorities because it makes the government here realise that we want independence," he said. But many people living in the south say this is a goal that is completely unattainable - not least because few people actually support it. "We've been part of Thailand for too long," said one man, too afraid to give his name. "We have different traditions, yes, but we're also Thai." It is unclear what these shadowy groups would be prepared to accept in terms of a compromise. The Pulo insurgent spoke of negotiations, a possible prisoner release and international mediation, but there was no mention of a climb-down on the idea of a separate state. Because of the secretive nature of these groups, it is difficult to estimate what they are capable of achieving. According to Dr Srisompob Jitpiromsri, a lecturer of political science at the Prince of Songkhla University in Pattani, the style of attack - small-scale bombings, shootings and arson - is unsophisticated. "School students can make these plastic bombs if they want to," he said. But he added that this simplicity could well belie the insurgents' capabilities, as they appear to have learnt to plan attacks simultaneously across a large area - a feat which takes substantial organisation. The Pulo insurgent said his group's weapons came from the security forces, either secured during robberies or via deals with local officials. He denied that Pulo had been given help from international groups such as al Qaeda or Jemaah Islamiah. 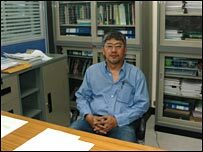 Dr Srisompob also believes that major foreign links are unlikely, given the different objectives of Thai insurgents compared to militants campaigning for a global Islamic jihad. "The attacks here are very localised, and so far Westerners have not been targeted. If Jemaah Islamiah had much influence, that would be very different," he said. But Dr Srisompob did not rule out links completely, at least at a local level. People over the border in Malaysia are also likely to be involved to some degree. "The insurgents move back and forth from northern Malaysia, and they may receive their training there," Dr Srisompob said. The big fear for many Thai people is that the insurgency will spread to other parts of the country, such as Bangkok or the tourist resorts of Phuket or Samui. The Pulo insurgent did not rule this out, although Dr Srisompob said such a step was unlikely given the localised nature of the violence. But predicting the next move of these shadowy militant groups is virtually impossible, given the paucity of information about how they operate. A local restaurant owner summed up the problem well. "In Iraq and Lebanon, people at least know why the shooting is happening. Here no one really knows anything." On Wednesday, Kate McGeown talks to some of the victims of the violence about their search for justice.